For those of you who don’t know, Kinmount is a little village located on the Burnt River. It’s half in the Kawarthas, half in Haliburton Highlands. It’s sitting pretty with a population of approximately 500 people, though that number goes up drastically come summer when in-the-know cottagers and campers show up. It’s a great ‘base camp’ for anyone looking to explore the trails of the area, but it’s also a hub for the community at large. Even if you’re not outdoor inclined, you can easily lose yourself for a weekend wandering the areas many adventures. Here’s what our Perfect Weekend in Kinmount would look like! 1. There’s a funny thing you should know about Kinmount. 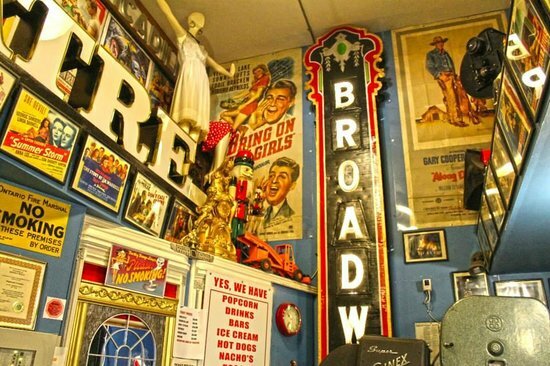 This movie-loving town has more theatre seats than people thanks to the Highlands Cinema, a 550-seat retro cineplex that’s been drawing people from near and far for over 200 years. According to their website, the owner who runs from theatre to theatre to start each movie, uses movie projectors dating to the mid-1950s, which he swears are better than anything built today. 2. In the summer months, the Kinmount Farmers’ Market is well worth a visit. There’s live music, folks making pizza on site and plenty of vendors serving up regional specialities. The market runs Saturdays at Austin Sawmill Park from 9am until 2pm. 3. Do you love trains? One of Ontario’s best train museums (and model railways!) is in Kinmount. The Kinmount Railroad Museum showcases the areas history but also acts as a community hub for events throughout the year. 4. Our love of authentic, small town fish & chips knows no bounds. In Haliburton, we’re big fans of Kinmount Fish and Chips. The tiny blue hut is a favorite amongst locals who not to skip out on the super crispy, skin on fries. 5. For a seriously delicious meal, snag a table by the window at Rhubarb Restaurant in Minden. The #FeastOn Certified dining room overlooks the lake, which is the perfect backdrop for a pint of Boshkung beer — also brewed on site! 6. If the weather permits, don’t skip out on tubing the Gull River. There are plenty of companies who offer the experience, and the rolling current doesn’t disappoint. 7. For something a little different, stop for a curry at Suwan’s Thai… and antique shop! Browse their collection of oddities before sitting down to a Panang Gai next door. For a thousand and one ways to have fun in The Kawarthas, check out their new website! For more ways to eat, stay and play in the Haliburton Highlands, check out #MyHaliburtonHighlands!